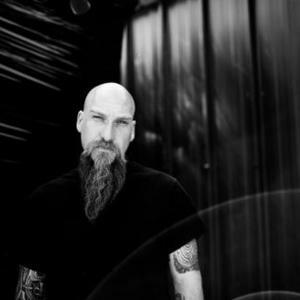 Harvestman is the brainchild of Neurosis vocalist and guitarist Steve Von Till, and the first album, Lashing the Rye, was created largely by Von Till over several years during lulls in his productive schedule of writing and performing with Neurosis, Tribes Of Neurot and his own solo endeavors. While he played and recorded much of the album, select guest collaborators contribute vocals and cello (Surround Me) and bagpipes (Green Hills of Tyrol / The Battle's O'er) amongst other flourishes to various tracks. Harvestman's second album, In a Dark Tongue, was released in Spring 2009. Musical missive number two (or three if you count the sidelong Fear Falls Burning remix from a few years back) from Harvestman, the cosmic folk space raga alter ego of Neurosis' Steve Von Till. The first Harvestman record, Lashing the Rye, released in 2005, was a dizzying confluence of delicate seventies British-style folk, shimmery spaced out drift, and glacial doomdrone sprawl, a constantly evolving, organic song suite that seemed to exist in some glorious blissed out otherworld. On In a Dark Tongue, the glimmering strands of traditional folk music that tethered the first record become even more tenuous. Even at its spaciest, Harvestman seemed grounded and earthbound, certainly with an eye to the stars, but the sounds evoking frosty mountainsides, deep forests, blackened skies, as much as strange shapes in the heavens and mysterious galaxies, the soundtrack to a strange terrestrial world, lit by the contrails of mysterious bodies streaking across the heavens. Like Lashing the Rye, In a Dark Tongue is also a weathered megalithic sonic artifact of an unknowable culture, its symbols obscure yet magnetic, calling one into communion with its ancient spirit. Enduring, unnerving, moving. Evoking arcane rites, cold hazy sunrises, a god/dess visible only in the massive wheeling patterns of nature and sound. But ? Dark Tongue moves beyond its predecessor, creating a linked, yet wholly other sonic landscape, at once more abstract and ethereal, but also heavier and more dense, with a black hole intensity woven into the otherwise kaleidoscopic drift, the sound constantly shifting from woozy, bleary eyed psychedelia to loosely propulsive spacekraut groove, fluttery delicate thrum to wild metallic squall, all doused in effects, a warm fuzzy patina of gauzy blur and muted buzz. It's almost as if the songs here are not so much songs as transmissions, broadcast from a lost land, messages from the original Harvestman, sprawling lysergic druidic rituals, wreathed in the sonic detritus of the sound's endless journey, a message home - or a message lost and drifting endlessly through the black expanses of time. Recorded in his home studio deep in the forests of North Idaho, United States, Harvestman draws from the surrounding landscape, unfurling softly buzzing, spidery barely-there melodies that hover in druggy expanses of Tangerine Dream warped guitar blur, hazy and delicate yet dark, an alien psych folk rendered in shades of space rock. Soft whispery steel string strum gives way to ultra distorted ur-drone ragas, the guitars super saturated and crumbling, leads that sound more like bagpipes than guitars, the sound warped and blown out, but still warm and tranquil. Fluttering mellotronic flutes flit dreamily around slow shifting sheets of soft swelling chords, smeared with streaks of glitch and whir. Slowly sprawling grooves underpinned by squalls of outer space FX and upper register feedback, all draped over brittle layers of jagged crunch, throbbing motorik beats wrapped in thick swaths of delay, decay and rumble, everything locked into hypnotic lurching loops. The vocals are sparse, in fact on ? Dark Tongue the vocals creep to the surface on only one track, the brooding expansive By Wind and Sun. Von Till's raspy croon, equal parts weathered Tom Waitsian bellow and Neurosis-style metallic howl, rough and raw, but still soulful and dramatic, a haunting ritualistic chant, although as the song progresses, Von Till's voice begins to transform and splinter into strange fragmented shapes, the various shards sent spinning into the ether, gradually evolving into another washed out and heavily effected layer of sound, that seems to melt into the swirling and whirling sounds all around it. There's even one track, Music of the Dark Torrent, with what sounds like a Koto, super spare and abstract, channeling Eastern classical music, but layered with slivers of minor key guitar growl, the whole thing eventually erupting into a malfunctioning electronic freakout. The whole record is a constantly shifting sprawl of electric guitars and synthesizers, dulcimers and ring modulators, loops and vocals, delay and distortion. Members of the Grails and Om contribute, but here they play acolytes to Von Till's high priest, together invoking the spirit of German Oak, Amps For Christ, Can, Six Organs of Admittance, Sunn O))), Faust, Growing, Amon Duul, their sonic shadows dancing on the looming stones assembled in the flickering firelight, beneath a sky of diamond and obsidian. In a Dark Tongue is a gorgeous slow burning psychedelic song cycle, smoldering minor key epics, the sounds lustrous and organic, the guitars viscous and virulent, the atmosphere murky and mysterious, all the while strangely sun dappled and dreamlike. Strings soar and sing, melodic fragments are hurled spinning into the abyss, monolithic guitar drones flow into fields of ephemeral stasis, a sound not heavy so much as darkly effulgent. The two longest tracks appear to be the space rock centerpieces, channeling the extended heart-of-the-sun outros of Hawkwind and the smoked out stomp of old Monster Magnet into classic krautrock heaviness, each a mesmerizing soundtrack to some seemingly and perhaps ultimately doomed mission into the unknown, both rife with relentless rhythms, roiling psych drone tumult and thick warble-y synths, underpinning moody meandering melodies and frictive soft focus textures. While Harvestman most definitely exists within an esteemed sonic brotherhood, the sound transcends. Von Till proves to be a master of more than massive pummeling heaviness, displaying a flair for the delicate, the tenebrous, the contemplative and the hallucinatory, having created with In a Dark Tongue a sound both portentous and elegiac, an arcane and esoteric bit of beauty, of dark hued mystery, of folk flecked abstraction and churning leviathan heft. A breathtaking and expansive glimpse beyond the firmament, into the soul of a sound, where the already blurred lines between drone and doom and drift and psych and kraut and space cease to exist at all.